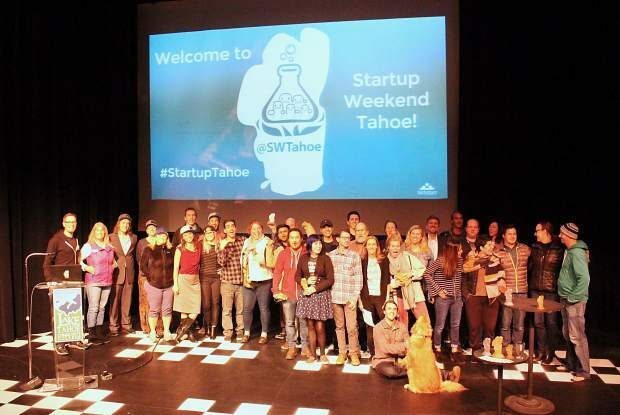 In 54 hours, Startup Weekend Tahoe helped participants get a business idea off the ground and make connections with regional business incubators, mentors and investors. In just 54 hours, a group of budding entrepreneurs launched a handful of unique businesses as part of Startup Weekend Tahoe. Startup Weekend, put on by worldwide business accelerator Techstars, came to South Lake Tahoe from Nov. 3 – 5. The event brought together developers, designers, marketers, product managers and startup enthusiasts to pitch ideas, form teams, build products or services, and ultimately launch a business. After a weekend of hard work, the teams pitched their ideas to a panel of three judges: Ashley Clift-Jennings, founder/CEO of Girlmade, Parlor Shows, and principal at Clift & Co; Jen Gurecki, CEO of Truckee’s Coalition Snow; and Jeff Saling, cofounder and director of statewide incubator StartupNV. First place was awarded to the team behind BFF Bars, a human-grade power bar that is safe to share with dogs. 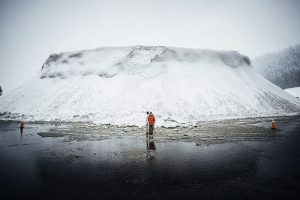 North Shore-based marketer Darcy Boles said the idea came to her three months ago from her own experience with traveling and being on the go with her golden retriever Blanch (who was on stage for the pitch). “My idea wasn’t in tech so I wasn’t sure if it was the type of business they were looking for. I actually thought I had the worst idea,” said Boles with a laugh. Ultimately the judges were impressed with Boles’ unique product, marketing strategy and well-branded slideshow — including hand-drawn images of Blanch by team member and Lake Tahoe Community College freshman Sarah Cutter. Using the first place prizes, including three months at both StartupNV and Tahoe Mountain Lab and a yearlong membership to Buzz Tools for social media support, Boles said she plans to keep working to get BFF Bars off the ground. Boles even received an offer from local tech entrepreneur Shawn Kernes to fund the first 10,000 bars. “It’s really exciting,” said Boles, who is speaking with her teammates from Startup Weekend to see if they’d like to continue working with the business. Second place went to Snow Go Now!, an on-demand snowplowing service that allows people to send a text message to an automated system with a request for driveway clearing. People who own snowplows can also text in to pick up work. 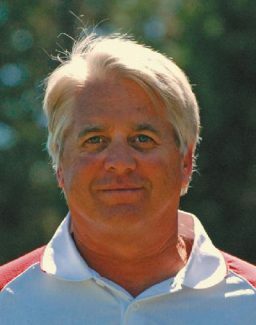 The idea for this service came to South Lake Tahoe resident Diana Peticolas and her partner Rick Madden in January after the drought-busting winter left residential snowplow operators overworked and turning down jobs. “I drive for Uber and Lyft so I know how their platforms work with the app system, and that was actually what I originally pitched on Friday,” said Peticolas. But after teaming up with South Shore software developer Ben Damman, the team decided upon an automated text messaging system, which Damman created in just one weekend. “Once Ben showed us and did the coding, I realized it was going to be a better, smoother operation than an app platform,” said Peticolas. Peticolas and Madden are now in the process of filing for a business permit in South Lake Tahoe. “From starting with the idea pitch on Friday to what happened Sunday, I had no idea it would turn out like this,” said Peticolas excitedly. Judges awarded third place to Every Minute Counts, a mindfulness app that reminds users to stop and take a break for one minute every hour. Every Minute Counts is the brainchild of health coach Ashlyn Owings, who saw how stress was affecting her clients. Though the app is free, users can pay for additional perks like guided breathing exercises and binaural beats, which have been shown to synchronize brainwaves. The remaining two business ideas developed throughout Startup Weekend Tahoe were Ride ‘r Drive, a long-distance ride-sharing app, and Boats & Snows, a watercraft membership package. Tahoe Mountain Lab cofounders David and Jamie Orr, both event organizers and coaches at Tahoe Startup Weekend, said they were very pleased with the outcome. David said they are looking forward to bringing Startup Weekend Tahoe back again in the future, but a date has not yet been set. “We both feel that this was one of the most impactful events we have ever organized,” added Jamie.